Advanced materials, predictive analytics and expertise in simulating vehicle behaviour... you can start to see why the Californian giant might be interested in a relatively small business based in Woking. Apple ploughed $1bn (£770m) into Chinese ride-hailing app Didi Chuxing earlier this year and is testing driverless electric cars. Jim Holder, editorial director at Haymarket Automotive, said that Apple updates its products every year, whereas carmakers only do it every five to seven years. Such is the pace of development within Formula 1 that McLaren will upgrade and refine its racing cars multiple times each week during a season. 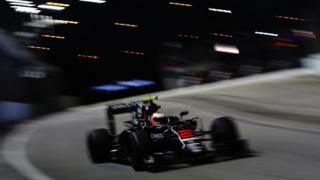 It is thought that Apple is particularly keen on McLaren's expertise in rapid response times. If Apple wants a prototyping arm with established credentials - McLaren is a great fit. Mr Holder added Tesla has disrupted the car industry, but Apple buying McLaren would be much bigger.